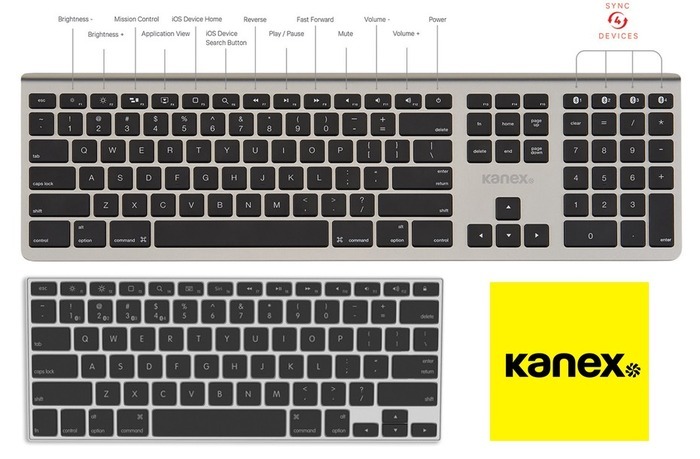 Kanex、4台のMac/iOSデバイスを切替え使用できるフル&ミニサイズBluetoothキーボード「MultiSync Aluminum Keyboard」シリーズを発表。 | AAPL Ch. The Kanex MultiSync Aluminum Mac Keyboard features a premium aluminum finish, while the MultiSync Mini Keyboard is made of stainless steel, both complementing your Mac and assuring durability for everyday use. Their sleek profiles will feel right at home next to your favorite Apple devices, inspiring a simple, elegant, and consistent style in your home or office. Modern yet functional, the keyboard’s low profile keys also provide a comfortable typing experience.